Mr. Christopher L. Thompson, president of and CEO of "Brand USA"
Mr. Christopher L. Thompson will begin his work on Nov.1, 2012 as president of and CEO of "Brand USA," the public private partnership responsible for spearheading the United States' first nationally coordinated tourism marketing effort, Brand USA's Seoul Office announced in its news release on Oct. 14, 2012. The release said that Mr. Thompson was appointed to the current position by the board of directors of Brand USA on Sept. 27, 2012. Prior to Brand USA, Thompson led the state of Florida's destination marketing efforts as president and CEO of VISIT FLORIDA, one of the nation's most successful destination marketing organizations. He will succeed Caroline Beteta, who has been interim president of the organization since June 21, 2012, in addition to her role as president and CEO of Visit California and her role on the Brand USA board of directors. Thompson is currently working with the board of directors of VISIT FLORIDA to ensure a smooth transition from his current role to Brand USA and will be announcing an official start date soon. The news of Thompson's appointment comes at a pivotal time in Brand USA's growth. The organization enters fiscal year 2013 on October 1, 2012, with a great deal of momentum and on the heels of its successful inaugural campaign (in Canada, Japan, and the United Kingdom); the establishment of international representation in eight markets (the United Kingdom, Ireland, Germany, Austria, Switzerland, Japan, South Korea, and Brazil); the completion of its first sales mission (in India); and the launch of a Tourism Exchange Year with Japan. Operationally, Brand USA has strengthened its operational infrastructure and cost efficiencies, as well as elevated its responsiveness to industry and government stakeholders. In addition, over the past year, the organization has successfully established key partnerships with more than 260 travel brands and destinations representing a cross section of the industry. These partnerships are generating millions of dollars in contributions to support the nation's tourism marketing effort. Thompson has nearly three decades of experience in the tourism industry. In his most recent role as president and CEO of VISIT FLORIDA, he led the organization's growth and success in a number of areas, including exponential year over year record growth, numerous operational and marketing awards, and extensive international tourism expertise. "We are thrilled to welcome Chris as Brand USA's president & CEO," said Caroline Beteta, chair of the Brand USA board of directors. "Chris is a proven leader with extensive strategic and operational experience who is widely respected throughout the travel industry and by elected and government officials. Moreover, he has extensive experience in generating nearly unprecedented growth in international travel to the United States and establishing mutually beneficial partnerships that have resulted in record growth. We are fortunate to have someone of his caliber at the helm of Brand USA," Beteta added. In his role as president & CEO of Brand USA, Thompson will be responsible for accelerating the organization's efforts on building and executing effective marketing strategies to increase inbound travel to the United States, resulting in increased U.S. exports and increased employment. These programs consist of marketing, public relations, and partnership programs critical to the overall marketing of the United States as the world's premier travel destination, as well as communications programs to provide travelers with vital information that inspires and makes it easier to explore the vast range of experiences and destinations available in the U.S.A.
"I am honored to be entrusted with leading Brand USA as its president and CEO," said Thompson. "Brand USA has achieved significant milestones over the past year, and has an ambitious set of goals charted to become the world's leading global destination marketing organization. I look forward to collaborating with the travel industry and our partners in the United States government in order to generate globally leading job creation, GDP, export growth, and revenue for our nation through the power of travel." Thompson was one of the industry leaders who helped lead the effort to gain support for the passage of the Travel Promotion Act, which was signed into law in March 2010. He subsequently became a key member of the task force charged with guiding the launch of the Corporation for Travel Promotion created by the Act (and which today does business as Brand USA). Thompson began his career in tourism with the Division of Tourism in the former Florida Department of Commerce in April 1983. He was appointed bureau chief over domestic tourism in April 1986 and in November 1988 joined the the Leon County (Florida) Tourist Development Council as the organization's first executive director. In April 1991, Thompson took leadership of the Tallahassee (Florida) Area Convention and Visitors Bureau as president and CEO. In August 1995, Thompson founded MarketServe, Inc., a professional management, marketing and planning services company based in Tallahassee, Fla. Two years later, he joined VISIT FLORIDA as senior vice president, partner development and was promoted to chief operating officer in May 2003. In May 2009, he was named the organization's president and chief executive officer where he led VISIT FLORIDA's impressive growth on a local, state, national, and international level. 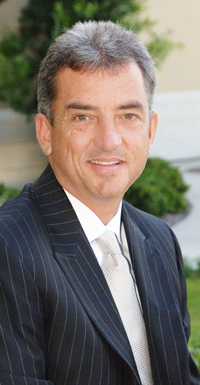 Throughout his career, Thompson has been honored with a number of industry awards and recognized for numerous accomplishments, including being named one of the "Top Twenty Five Most Extraordinary Minds in Sales & Marketing" by the Hospitality Sales & Marketing Association International in 2009. An active member of the community and the industry, Thompson is a Certified Destination Management Executive and currently serves as a member or board member of some of a number of influential business and travel industry associations and organizations, including the Travel and Tourism Advisory Board of the U.S. Department of Commerce, the U.S. Travel Association, Destination Marketing Association International, the Association of Travel Marketing Executives, International SKAL, the Southeast Tourism Society, and the Travel and Tourism Advisory Council, Miami Branch of the Federal Reserve Bank of Atlanta. Thompson earned his Bachelor of Science degree in Business Administration from the University of Florida in 1980. He and his wife, Susan, have two grown sons, Christopher and James. Brand USA was established by the Travel Promotion Act in 2010 to spearhead the nation's first global marketing effort to promote the United States as a premier travel destination and communicate U.S. entry/exit policies and procedures. Formed as the Corporation for Travel Promotion, the public-private entity began operations in May 2011 and does business as Brand USA. Brand USA works in close partnership with the travel industry to maximize the economic and social benefits of travel. Through its call-to-action—Discover America—Brand USA inspires travelers to explore the United States of America's boundless possibilities. The program's activities are funded through a combination of private-sector investment and matching funds collected by the U.S. Government from international visitors who come to the U.S. under the Visa Waiver Program. For industry or partner information about Brand USA, visit www.TheBrandUSA.com. For information about exceptional and unexpected travel experiences in the United States, please visit Brand USA's consumer website at www.DiscoverAmerica.com. For details oe inquiries call Brand USA's Seoul Office at 82-2-777-2733.